About us. 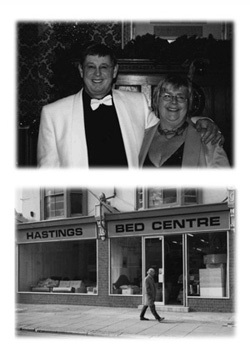 In December 1981, John & Sandra Pickering opened the first store in Queens Road, Hastings. In the years since, the company has expanded and currently operates from 8 branches across Sussex. Each store differing in character but all offering the same great products & services. John & Sandra are immensely proud of the good reputation Sussex Beds™ has earned over the years. A reputation built on sound principles of providing great products at low prices and also caring customer service. Sussex Beds™ is a true independent family business. This is immediately obvious with its warm welcome & relaxed shopping experience. Many of the staff you meet, from the showroom to delivery team are directly related to John & Sandra. All are on hand to help & guide you in finding products, which meet both needs & budgets. Each product proudly displays the Sussex Beds™ Brand. This is your guarantee the product has been carefully selected & tested. We do this to ensure it meets the Sussex Beds™ standards of quality & value. Thank you for visiting our website and we look forward to assisting you with your enquiries.